Tonight was yummy dinner night. I made a recipe I saw on the Yahoo scrolly thingy on our home page. Evidently there is something called Shine from Yahoo. Who knew? Now I do. Anyway, there were a week's worth of delicioso recipes the other day, and I cooked one of them for dinner tonight. 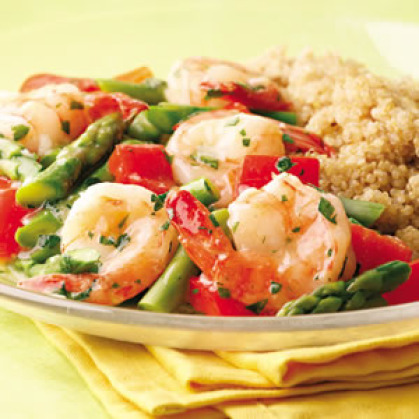 You've gotta try the Lemon Garlic Shrimp and Vegetables...to die for! Even the kids liked most of it. Carleigh wasn't too keen on the red bell peppers, and Luke didn't care for them either, but they gobbled down the squash, asparagus and shrimp with the wild rice-orzo! As long as I hid her asparagus in each rice bite, Cora ate it too. She didn't much care for the squash and bell pepper though and spit out one bite on Carleigh's plate. What a great big sister! The recipe didn't call for squash, but my friend brought me two beautiful yellow squash from her garden, and I couldn't resist using it. It gave the dish another gorgeous color and us another yummy veggie! I just seeded and cubed it and added it in with the other veggies. I would also suggest decreasing the amount of chicken broth to about 1/2 to 3/4 cup instead of a full cup. I'm not sure I was supposed to have quite as much liquid as I did, but it was still gooood! The recipe says to serve it with quinoa, whole-wheat couscous or linguine. I had a little bit of wild rice and a little bit of orzo (I think that's what it was), so I combined them, and it was perfect! So, what did you have for dinner? Do share. That sounds and looks so yummy!!!! I love shrimp and all the other ingredients with it.